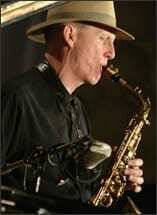 Rick Condit has been an active saxophonist and jazz educator for more than 25 years. He has taught and performed in 26 countries on 5 continents. In 2002, he spent six months as a Fulbright Senior Scholar at the “George Enescu University of the Arts” in Romania while on leave from his post as Director of Jazz Studies and Associate Professor of Saxophone at McNeese State University in Lake Charles, La. Since then he has returned to Romania four times for concerts, clinics and other Fulbright related projects. Originally from the San Francisco Bay Area, Condit spent more than 10 years there as a freelance professional, performing with such noted artists as Ella Fitzgerald, Louie Bellson, Ray Brown, Oliver Nelson, Bob Hope, and the San Francisco Symphony Pops Orchestra. During this period he also toured for over a year as tenor sax soloist with the Stan Kenton Orchestra, presenting concerts and clinics in 46 states, Canada, and Japan. Condit received his Master of Music degree in jazz studies from the University of North Texas, where he was a graduate teaching fellow and member of the One O’Clock Lab Band. His own group, the Louisiana Jazz 5, has toured France and Central America and performed at the IAJE Conference. Condit and guitarist Tom Wolfe toured 5 countries in West Africa as Kennedy Center Jazz Ambassadors, and he has been the recipient of a Louisiana Artist’s Fellowship. Under Condit’s direction, the McNeese Jazz Ensemble has performed at the Montreux Jazz Festival (Switzerland), Festival Internationale (Nice, France), the IAJE Conference, and twice in residency at Disney World. He is a Past President of the Louisiana Unit of IAJE, served 10 years as Section Coordinator for Latin America, and as Region Coordinator for the South Central U.S. Recent guest artists have included Bobby Sanabria and Quartetto Ache, The Yosvanny Terry Quartet, The Rosanna Eckert Quartet, the Arturo O’Farrill Quintet, Nneena Freelon, and The Marcus Roberts Trio. Rick plays Selmer MK VI saxophones and JodyJazz Mouthpieces.